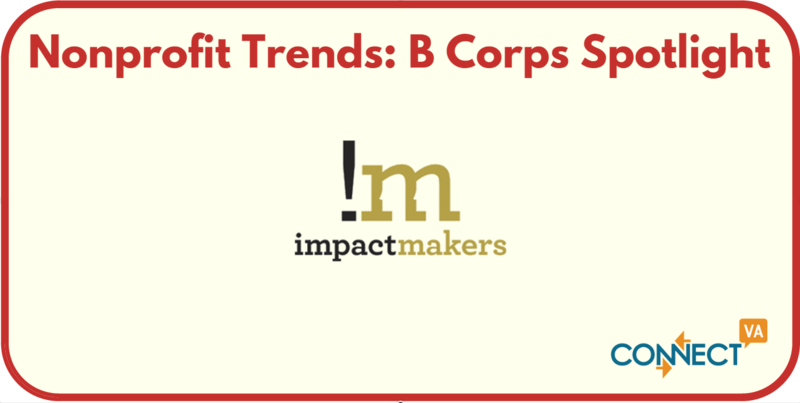 Over the past several weeks we have been sharing information about the rise of the B Corps movement. As more and more companies make community engagement a priority and add corporate responsibility pages to their websites, and as “benefit corporations” continue to rise, the definition of the social sector is becoming increasingly broad. In our final post on local B Corps, we will highlight Impact Makers – a management and technology consulting company that provides services in Management and IT Consulting, Program and Project Management, Digital Services, Governance, Risk and Compliance, and Healthcare Solutions. As you will see below, Impact Makers has been a true pioneer for seeking out innovative solutions for social impact – from their business model to building nonprofit partnerships and beyond. 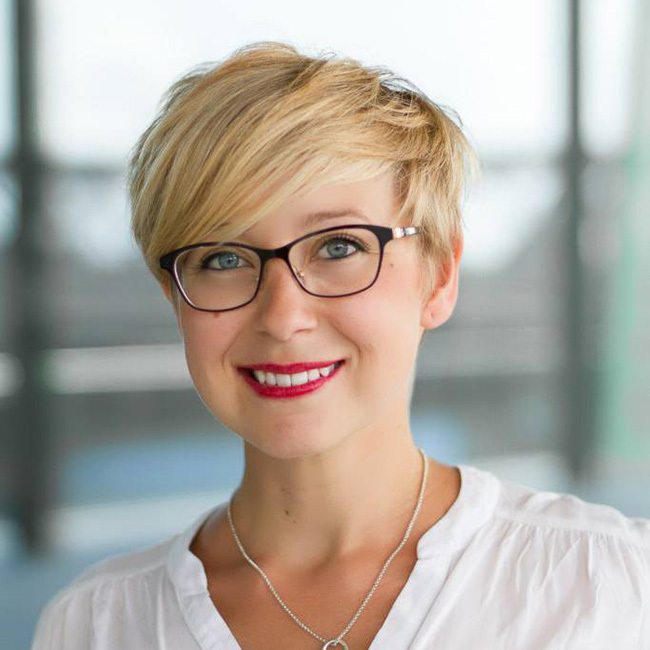 To learn more, we caught up with Anika Horn, the Impact Maker “B Keeper” whose role centers around creating partnership and educational opportunities to further the B Corps movement locally. What’s the mission of Impact Makers and what’s your business model? Impact Makers competes head-to-head for contracts in a very competitive professional services consulting world, and wins a great deal of them based on our competence and performance; in this sense, we are much like any other successful business. We’ve actually been named in the Inc. 5000 List of Fastest Growing Private Companies in America for the past 4 years, but our business model is much different than most. Our founder, Michael Pirron was on a mission to figure out how to use the power of the free market to solve social and environmental problems and decided that he wanted a business model that turns profits into wealth creation for the community rather than for shareholders. We are one of the founding B Corps and we work closely with B Lab (the certifying body for B Corps) to advise on the process and help promote the B Corps movement across the community. We contribute 100% of our net profits to charities over the life of the company and in April 2015, we announced the gifting of the company’s equity ownership to two nonprofit organizations, The Community Foundation Serving Richmond and Central Virginia and Virginia Community Capital. 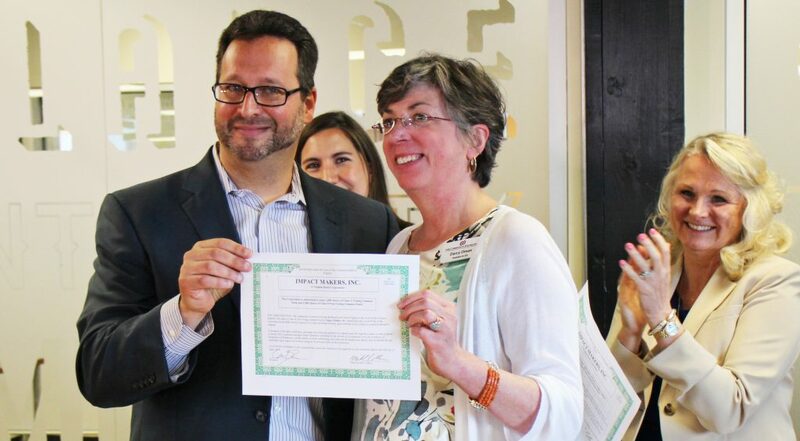 Michael Pirron, Impact Makers’ CEO hands stock certificate to Darcy Oman, former CEO of The Community Foundation, upon the announcement of IM gifting the company’s equity ownership to TCF and Virginia Community Capital in April 2015. How is your work impacting the community? In addition to our unique social enterprise business model, as a B Corp, the community as at the center of our work and top of mind in all that we do. We have four charity partners that we support financially and with pro-bono work throughout the year. Impact Makers encourages its employees to spend part of each week working with these partner organizations, or any community organization we prefer; this allows them to have a personal impact on the community. For the past three years we’ve been recognized by the Richmond Times Dispatch for being one of Richmond’s Top Workplaces. Impact Makers also organizes service events with other B Corps. Why do you think it’s attractive for someone to work for a B Corp? We have high interest for our open positions, and they are very competitive. I talked before about what an attractive place it is to work, because you feel like you can have a true impact in the community, while holding a career that you enjoy. It also helps that we pay market rates to our employees. Who are your nonprofit partners? Our 4 main charity partners are RX Partnership, Family Lifeline, Peter Paul Development Center and FLiPM. These organizations receive pro-bono consulting and monthly financial support. We also have 3 pro-bono partners who receive consulting services from us: IT4Causes, Midwives for Haiti and AHRC in New York. In terms of pro-bono support, each employee is given the opportunity to volunteer at least 20 hours per year in the community (on company time). Employees completed 905 pro-bono hours in 2015, bringing the total, since 2011, to 1525 hours. How are these partners selected? By our volunteer board of directors. Our board of directors has unique and critical roles and responsibilities that support our innovative social impact business model. The board chooses charitable partners who are secular, apolitical, and charitable 501c3s, that are local to where we do business and that help people help themselves; Our board assists with business development and lead volunteer committees. How long are these partnerships planned for? Do you all re-evaluate and take on new partners? Our community nonprofit partners are chosen based on where we have significant client work. Our intent is to work with each nonprofit long-term, so that we can help them grow and expand to make an even greater difference in the community. We recently added the three pro-bono partners, which includes AHRC in New York because we are continuity expanding where we provide our services and it is important for us to give back to the communities we work in. What’s next for Impact Makers and their work in the community? We are always looking at ways we can provide even more funds to help the community. That is why we just completed a capital raise of $2.4m in the fall of 2015, which will help us to accelerate growth for new and expanded service offerings for our footprint. Ultimately, our Big Hairy Audacious Goal (BHAG) is to make $100m cumulative impact by December 2024, which would include a sale of the company that puts much of that sum into funds at the Community Foundation and Virginia Community Capital. These funds will offer impact investments in socially responsible investments (with a preference for B Corps) with the principal, and philanthropic investments with the earnings. As of June 2016, we are close to $1.6m cash and pro-bono support to our charity partners. The value of our equity gifted to the community is worth over $18m which brings us close to $20m of total impact, if the liquid asset gifts given to the community are included. Applications are open for the first ever Unreasonable Lab Virginia taking place in Richmond from September 15th to the 22nd! This Virginia Business Model Validation Lab is a 7-day accelerator for early/idea-stage, East Coast-based entrepreneurs that are tackling social and environmental problems. Over four full and two half days, it is designed to do one thing: provide entrepreneurs with a step-by-step methodology to rapidly and systematically validate their venture’s business model. Apply by August 22nd. Find out more on their website: Unreasonable Lab VA.
As the B Corps movement grows in popularity, how will the sector compete for talent? How are nonprofits benefiting from B Corps? What do nonprofits have to learn from social impact businesses? To help answer some of these questions we will be talking to a few local B Corps to learn more about this unique sector and the impact they are making on the greater Richmond community. 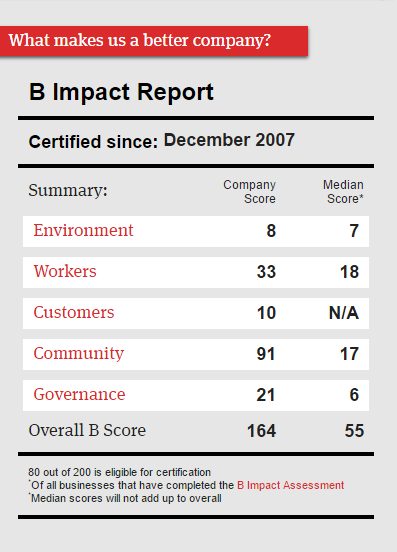 Check out our first post, which gives an overview of the B Corps movement and the benchmarks.